Will Say-on-Pay support continue to weaken in 2019? Shareholder support for executive pay programs — say-on-pay (SOP) — went down in 2018 by at least one measure: A record number of companies (72) failed to receive majority support, the most failures in any year since 2011 when SOP was first effective. 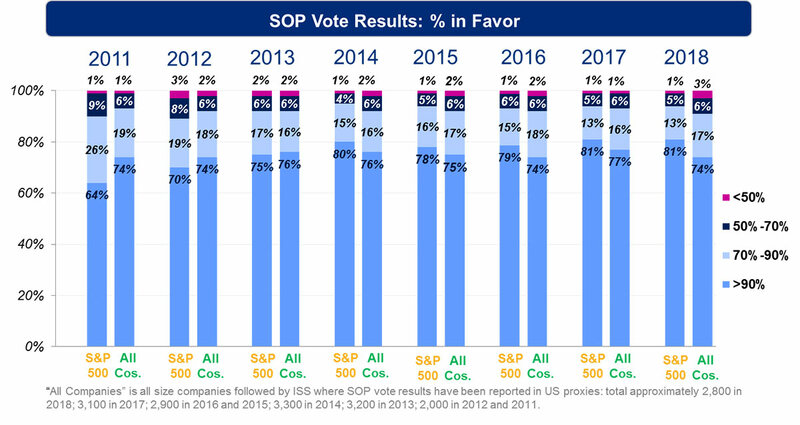 While the failure rate remains relatively low (less than 3% of companies each year), and overall support has been consistently high (averaging about 90% each year), there are some indications that SOP vote results could trend lower in 2019. The higher number of failures may continue in 2019 if investors follow CalPERS’ lead: In 2018, the pension fund manager voted against 43% of SOP proposals, up from a prior five-year average of 16%. Last year also saw the highest rate of "against" recommendations on SOP proposals from proxy adviser Institutional Shareholder Services (ISS), at 14%. This percentage could increase in 2019, particularly given the potential impact of the year-end 2018 stock market decline on ISS’s pay-for-performance assessments. Companies' proxy statements must discuss how results from the last SOP vote influenced their subsequent compensation decisions. If a company receives support below 70% (ISS) or 80% (for proxy adviser Glass Lewis & Co.), the proxy advisers and many investors expect additional disclosures the following year about steps the company has taken to engage with shareholders and address their pay and governance concerns. As a result, most companies that fail, fail only once, and many experience increased support the year following a failure. There is also a trend for companies that receive significant support to disclose the extent of their shareholder outreach program and responsiveness to shareholder concerns. The record high number of SOP failures in 2018 reverses a downward trend that began in 2014, and follows a record low number of failures (40) in 2017. While the failure rate remains low overall, 2018 saw an uptick from 1 or 2% to almost 3%. Since 2011, 361 companies have failed to receive majority support in at least one year, of which 66 failed two or more years and 295 failed only once. Levels of support for SOP proposals have generally been steady since 2011. The percentage of companies receiving favorable votes of at least 90% has hovered consistently around 75%. Larger companies continue to fare somewhat better than all-size companies: The percentage of S&P 500 companies receiving at least 90% support has been about 80% for the past five years. Year-to-year vote swings are common, particularly for companies receiving less than 50% support for their pay programs. Among companies that failed in 2018, support declined an average of 36% from 2017. Companies that failed in prior years experienced a similar drop from the year preceding the failure. The increase in favorable votes after the year of failure is equally significant: Support for companies that failed in 2017 increased an average of 27% in 2018, consistent with prior years' post-failure patterns. Among SOP proposals receiving an "against" recommendation from proxy adviser ISS, favorable votes are typically about 25% below those for proposals ISS supports (67% vs. 94% on average in 2018). It's not clear if the lower levels of support are a result of the ISS recommendations or whether ISS’ recommendations merely reflect investor views. Source: Institutional Shareholder Services Inc.
Includes all companies reporting say-on-pay vote results in US proxies. The rate of ISS "against" recommendations in 2018 was a record high for smaller (non-S&P 500) companies (15%), as well as all-size companies (14%), but generally consistent with prior years for S&P 500 companies (10%). ISS has typically viewed larger companies more favorably than smaller ones with respect to executive pay. As in most years, about one in six companies receiving an "against" recommendation failed to receive majority support from shareholders. Some view SOP as largely a rubber stamp on executive compensation, pointing to low SOP failure rates and high average support levels as indications that the vote has no teeth. But given that few companies fail more than once, and votes typically swing upward following a year of low support, it appears companies are heeding the message shareholders are sending. Companies are changing their pay programs in response to low SOP results, or proactively to avoid negative feedback. Before SOP, shareholders could demonstrate their dissatisfaction with a company’s pay and governance practices only by voting against compensation committee members and other directors — a rather blunt instrument. SOP has resulted in more companies talking with their investors to understand and address their specific concerns. or those raised by proxy advisers. Complete the form below to speak with a consultant and gain more insight into Say on Pay.